Join us for our mid-week Study and Prayer this Wednesday at 7:00 pm. Following prayer meeting, we begin our review and discussion of the Lessons and Discussion Questions from The Essential Jesus Challenge, titled – The Early Church of Jesus, (pages 170-178). 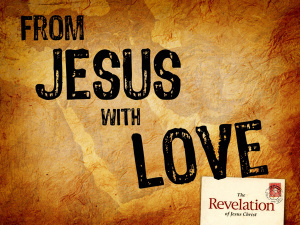 This section of study covers Revelation , Chapters 1-3. Please join us this Wednesday night, August 13 at 7:00 pm and remember to Study God’s Word each and every day. This entry was posted in Bible Study, Meetings. Bookmark the permalink.